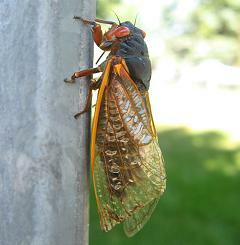 The Cicada is loud enough to damage human ears, and loud enough to drown out lawn mowers. But think how loud it would be if the female cicadas joined in. Only the males make noise, and the silent females seek them out. A cicada is an insect with large eyes far apart on its head and transparent, veined wings. There are over 2,500 species of cicada on earth and most live in temperate to tropical climates where they are well known, because of their size and crazy acoustic talents. Cicadas are sometimes called locusts, but are unrelated to true locusts. They are also called “jar flies”, and are related to leafhoppers and spittlebugs. In some parts of the U.S., they are known as “dry flies” because of the shells that they leave behind. Cicadas can cause a lot of damage to several cultivated crops and trees, and are eaten by many people around the world. Cicadas were even eaten in Ancient Greece, and today, shells of cicadas are used in traditional Chinese medicine. The name comes from the Latin word cicada, which means “buzzer”. In classical Greek, it was called a tettix, and in modern Greek tzitzikas, both names being onomatopoeic. Cicadas make its noise by stroking ridged membranes called tymbals on the sides of their abdomens. Their bellies are hollow, which helps to amplify the sound. Gathering in large choruses on tree branches, these crazy insects quickly attract lots of females who are ready to mate. Think of them as the boy bands of the insect world. A cicada’s hearing organs, by the way, are called tympana and are located on the bottom of its abdomen. You would think they would be deafened by all that racket by now.